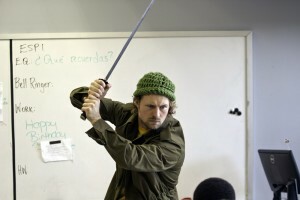 This still photo taken from a school crisis video scenario for the First 30 Seconds series depicts a man initiating an attack with a sword at a school. Focusing too intently on mass casualty school shootings can leave staff woefully unprepared for other types of attack methodologies. A violent school sword attack in Trollhattan, Sweden left a teacher and a student dead, another student wounded and many other staff, students and parents traumatized. This incident reminds us that no country is immune to horrific school violence and that prevention and preparedness measures should not be focused solely on attacks with firearms. Blades have long been a weapon of choice for school attacks in Japan, China, the United States and a number of other countries. While there have also been mass casualty shootings and fire attacks, edged weapons attacks at elementary schools in the People’s Republic of China in the past decade have resulted in hundreds of serious injuries and fatalities. In one attack, twenty-eight elementary children were stabbed with a butcher knife. Fourteen children were murdered with a butcher knife in another attack. Twenty-one students were also wounded with a butcher knife in a Chinese primary school on the same day as the terrible mass casualty school shooting at Sandy Hook Elementary School. Last summer, our video unit spent a day filming a wide variety of school crisis scenarios involving school weapons incidents. They filmed single victim shootings, hostage situations, several active shooter scenarios, and a scenario depicting a school sword attack in a classroom. We included this scenario because of actual incidents in the United States. For example, a school bus was high jacked by a student armed with a sword in Nevada and an attacker attempted to behead a Georgia high school principal with a machete in 1990. I have gone to great pains to provide a rational perspective when it comes to mass casualty attacks in American schools. We have documented that more than twenty people die from other causes for every fatality from K12 active shooter events. I have also emphasized how rare these events are. At the same time, I have repeatedly cautioned that these types of attacks will continue. I also believe that we have likely not seen the most lethal weapons assaults nor the most gruesome attacks we could see. The most gruesome and the most lethal attacks on American schools thus far occurred in 1764 and 1958 respectively. As we have seen many times with school attacks, history often does repeat itself. With intensive media coverage, internet discussion of mass casualty attacks and other contributing factors, we are assured to see more of these tragic incidents at home and abroad. Considering the broad array of school attack methodologies we have repeatedly seen such as the use of guns, edged weapons, fire, vehicles and hazardous materials can help us better prevent, prepare for and recover from these tragic events that have been taking place in schools for more than two centuries.